A Revamped Website, Official Twitter & MORE! So did some massive revamping for the website. It was about a two day affair, just cleaning up everything and also made a custom background with profile picture for Twitter/Facebook. Currently working on one for YouTube & G+. But I kept it simple by going back to basics. Rather having a prominent black and red theme colors like in the other logo previously. Although I liked it. It was just to busy for my liking… When I first made it I went for the old classic EC comic feel that’s been beaten up a little. Now over this past year I’ve had more writers jump on board this website now and it just seems kind of a selfish move the just have a cartoon characteristic of myself as a superhero that is dead center of the logo. Not really representing the group as a whole. So that had to change and redesign the whole thing. Changed the color theme with more of a lighter blue/electric blue and some points, give it a classic comic book backgrounds with dots. Also made a superhero silhouette background with the atom symbol. I like how it came out! A lot of work but it came out pretty good I think. I also figured I post some of the past logos I’ve made for this website kinda like a evolution type deal. Some of them are really bad and hokey, but it definitely gets better with age. 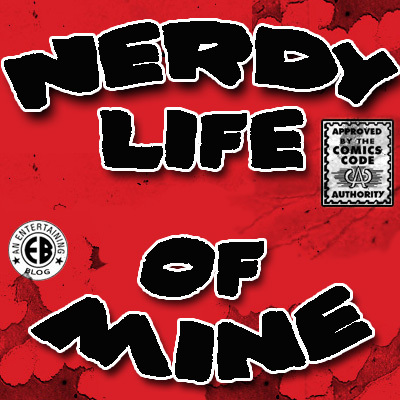 I’ve also made an official Twitter account for nerdy life of mine. I was rather shocked because I just open it yesterday and it started to escalating well into 150 to 200 followers already just a short few hours. So if you would like to follow it’s @nerdylifeofmine. And now news about podcasting!! In a upcoming post I’ll layout the current schedule for a July and August with some recent modifications . I’ve made note in some other posts that Random Nerdness poadcast is ending :(. Chris Lockhart is ending Random Nerdness due to just having too much on the plate, plus with a family life somehthings had to change. So Geek Fallout and Geek Follow (the comic book episodes), as well as Trek1701 are still running and going strong. So we’ll be doing those. Also we’ll be taking part in the Extraordinary League of Bloggers every Monday will be doing a certain topic and sharing back and forth with other bloggers. Its something very cool and very fun! Plus it helps open doors for other genres nerdom, also it’s a good way to promote things & that never hurts :). I also like to take a moment and say thank you for all the readers and writers for the support over these past wacky & crazy few years. This websites has had it’s highs and lows, coming into it’s own with other people taking part in to it. Big thank you for everyone that’s taken part in this website and also it’s loyal followers.